General Practice Psychiatry is compiled by a combination of practitioners and academics working in general/family practice, psychiatry and psychology. 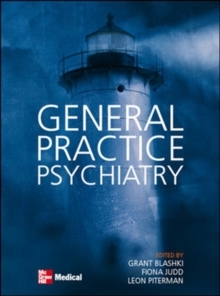 As General or Family Practitioners (GPs) are often the first contact for clients with mental health issues, this book focuses on higher prevalence disorders and common problems that GPs may encounter, and offers a systematic, highly practical, problem-based approach to their diagnosis and treatment. General Practice Psychiatry also offers current guidelines on pharmacotherapies regularly used in the treatment of such psychiatric disorders and illnesses.